Update: The first images of the Vans 12-piece collection with Karl Lagerfeld are here (via Vogue). Wait till you get a load of this ponytailed checkerboard pattern. 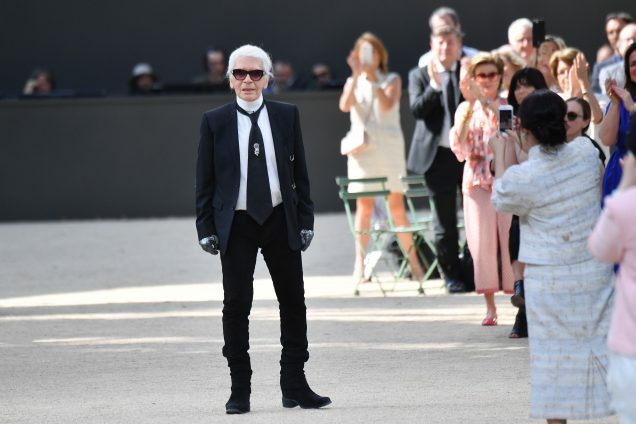 Karl Lagerfeld is upping his street cred. Today, WWD announced that the Kaiser is teaming up with the world’s most iconic skate shoemaker, Vans. On September 7, Lagerfeld (by way of his namesake brand) and the California-based footwear label beloved by professional skateboarders, streetwear enthusiasts and laypeople alike will release an entirely black-and-white capsule collection. Between this just-on-the-cusp-of-fashion-week drop and the glittery, candy-colored Vans x Opening Ceremony lace-ups that moved like wildfire this past March, we expect to see loads of uncharacteristically pristine skate shoes outside the fall shows. The limited-edition Vans x Karl Lagerfeld capsule will feature a number of classic Vans silhouettes, including the Classic Slip-On, Sk8-Hi and Old Skool. All will be laceless, redone in leather and emblazoned with a quilted letter K. There will also be apparel, including a black-and-white raglan sleeve bomber and a T-shirt showing Lagerfeld wearing a checkerboard tie — which would obviously never happen IRL — and a premium leather backpack sporting the aforementioned quilted K motif. Speaking of checkerboard, Vans re-designed its trademark pattern for the capsule, replacing the squares with Lagerfeld’s ponytailed profile. “Fusing the two brands’ respective universes, Vans’ hallmark checkerboard pattern is revisited using a cameo motif depicting Lagerfeld’s iconic profile, with boucle fabric and a quilted letter K among other leitmotifs,” reports WWD. The capsule will make its debut at Berlin’s Bread & Butter trade show. It’ll hit Karl Lagerfeld stores, select Vans stores and both brands’ websites a few days later. Prices range from $40 to $300 (which we’re hoping refers to the backpack, because that’s a kinda insane amount to pay for Vans — even Lagerfeld-branded ones). Head over to @WWD to get an exclusive first look at the Vans X @karllagerfeld collection. Come see for yourself at @breadandbutter, from the 1st to the 3rd September where we will be showcasing the collaboration.